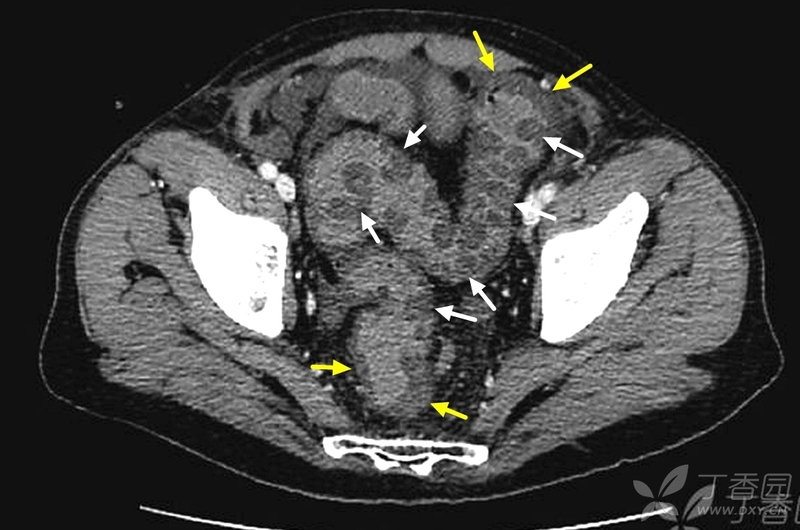 A 63-year-old man presented to the emergency department with a 3-day history of abdominal pain that had started in the periumbilical area and subsequently shifted to the left lower quadrant. The physical examination revealed tenderness in the left lower quadrant. Initial laboratory tests showed a white-cell count of 12,000 per cubic millimeter (reference range, 4000 to 10,000) and a lactate level of 1.8 mmol per liter (normal value, <1.9). Contrast-enhanced computed tomography of the abdomen, performed to evaluate the possibility of complicated diverticular disease, revealed edema of the sigmoid colon with thumbprinting — a finding that results from the haustra of the large bowel becoming thickened and projecting into the intestinal lumen at regular intervals. This radiographic sign can be seen in ischemic colitis, pseudomembranous colitis, and other types of infectious colitis, as well as in exacerbations of inflammatory bowel disease. The patient’s stool tested negative for Clostridium difficile toxin. The findings on rectosigmoidoscopy were consistent with a diagnosis of ischemic colitis. Because the patient’s condition did not improve with conservative measures, including intravenous fluids, antibiotics, analgesia, and bowel rest, an exploratory laparotomy was performed. The sigmoid colon was found to be necrotic and was resected, and end colostomy was performed. The patient’s clinical condition gradually improved, and he was discharged on the eighth postoperative day. At follow-up 3 months after surgery, he remained free of symptoms.